Product Condition: The Vidda Pro Long Pant - Men's is in Excellent condition. These pants were previously owned for three weeks. The following observations were made regarding these item. *They were tried on in indoors for an occasion. *There isn't any defects in them at all. *They got minor pet hair, cleanable. *The original vendor tags are still attached in them. *All items sold as is, all warranties void. Sure, you have a nice sturdy jacket, but what about your lower half? 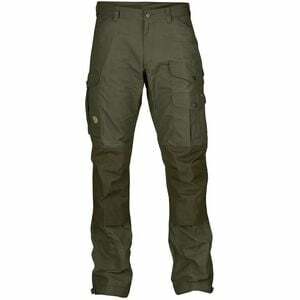 Give your legs all the performance and protection they deserve with the Fjallraven Men's Vidda Pro Pants. Made with Fjallraven's durable G-1000 fabric and reinforced at the knees, these pants were built for use in demanding wilderness environments, so you can hike mountains, chop wood, and build fires in style.